My mother doesn’t have a sweet tooth at all, we are complete opposites when it comes to cakes and dessert. I have no problem scarfing down a quarter of a cake on my own, and she’s happy with a slice so thin that I wouldn’t even bother cutting it. We look very much alike, we share the same birthday month and we both love to make a daily feast out of our lives, but our sweet preferences couldn’t be further apart. 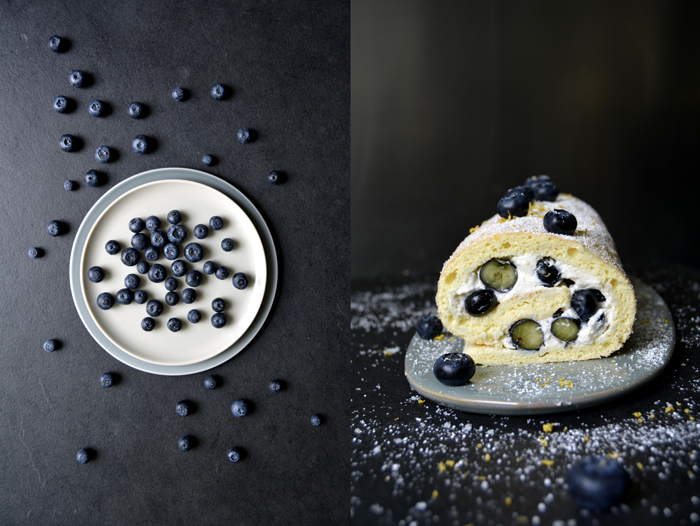 So when she visited us last week, there weren’t many sweet treats on our culinary schedule but when I put my blueberry lemon swiss roll on the table, she impressed me. I was prepared to cut impossibly thin slices for her but, to my surprise, she got hooked on the roll. Usually, I’m the one who takes the last piece of a cake, my reputation is well known in my family when it comes to sweets, my appetite is insatiable. You can offer me the most extensive meal but even if I have to struggle towards the end, there’s always space for a well sized dessert. But this time, the last piece wasn’t for me, my mother asked for it and I don’t think I’ll ever forget this moment. 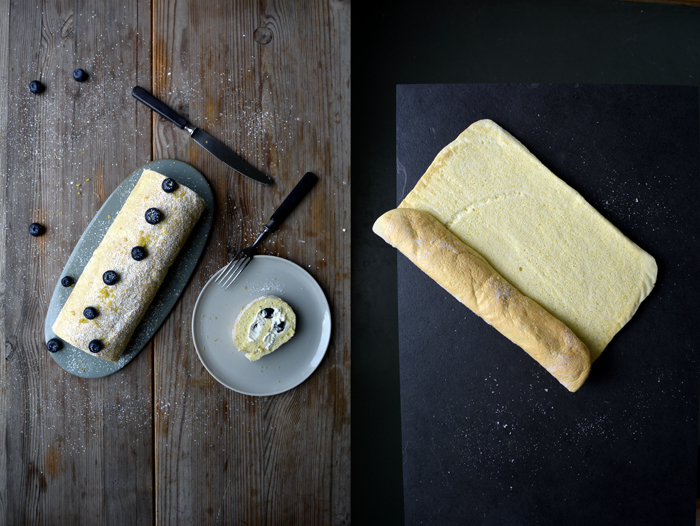 I must admit that my swiss roll was tempting on many levels, the spongy cake is absolutely heavenly, light, fluffy but structured, refined with lots of lemon zest. 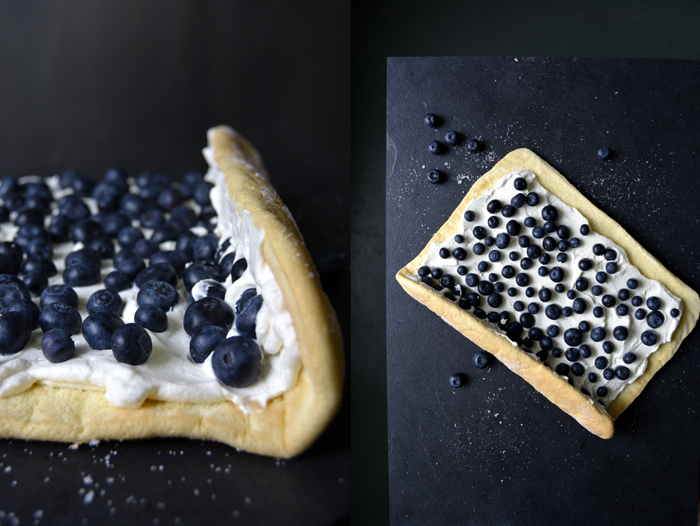 The blueberries added a juicy crunchiness but the cream filling was the actual star that made the whole composition complete. 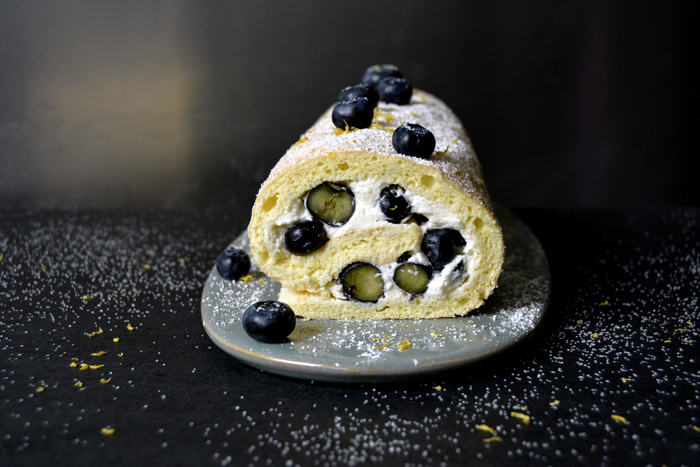 I whipped the cream with a little sugar and cardamom which creates an addictive deliciousness in combination with the lemony roll. The three of us loved it so much that this huge roll didn’t even last 24 hours! 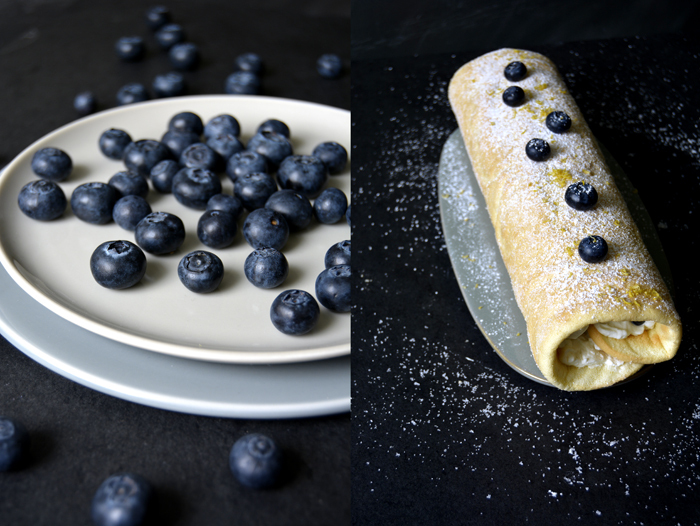 Here’s the link to my strawberry swiss roll! Set the oven to 220°C (top / bottom heat) and line a baking sheet (minimum 30 x 30cm / 12 x 12″) with parchment paper. Whisk the egg whites with a pinch of salt for a few seconds before you add half the sugar, continue beating until stiff. Mix the egg yolks, lemon zest and the remaining sugar with an electric mixer until thick and creamy. Fold the egg white into the egg yolks with a wooden spoon. Sieve and combine the flour and cornstarch and fold gently into the egg mixture. Spread the dough on the lined baking sheet (30 x 30cm / 12 x 12″) and bake in the middle of the oven for 6 minutes or until golden and spongy. Sprinkle a kitchen towel with 2-4 tablespoons of sugar and flip the warm sponge onto the towel. Peel off the parchment paper and carefully roll the sponge with the towel. Leave it rolled up until cool. You can see the picture in my strawberry roll post (link above). Whip the cream, cardamom and 2 tablespoons of sugar until thick and creamy and adjust sugar and spice to taste. Unwind the sponge roll carefully and lay it onto a working surface. Spread the whipped cream on the cake, leave a rim of 2cm / 3/4″. 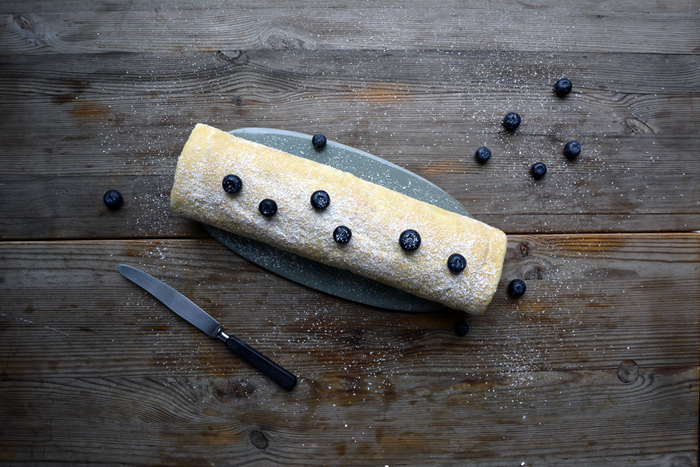 Cover with blueberries and roll it up again, slowly and gently, mind not to squeeze the cream out from the sides. 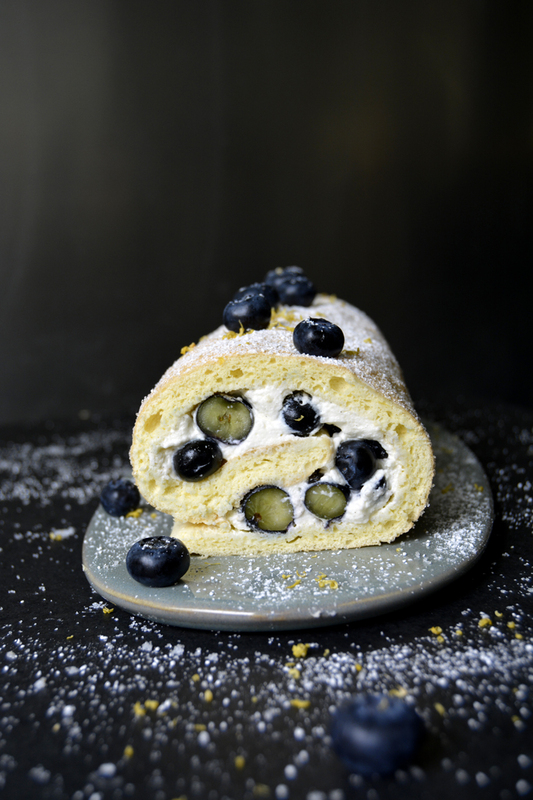 Dust with icing sugar and decorate with the berries and a little lemon zest. 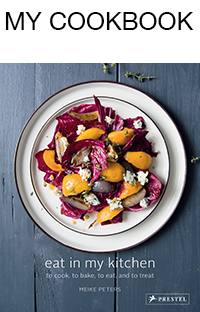 Serve immediately or keep in the fridge before serving.